IPCC (2007) concluded that 'in mid- to high-latitude regions, moderate warming benefits crop and pasture yields, but even slight warming decreases yields in seasonally dry and low-latitude regions (medium confidence)'. In IPCC language, moderate warming is in the range of 1-3°C. Smallholder and subsistence farmers, pastoralists and artisanal fisher-folk will suffer complex, localized impacts of climate change (high confidence). Food and forestry trades are projected to increase in response to climate change with increased dependence on food imports for most developing countries (medium to low confidence). The report further concluded that warming beyond 2-3°C was likely to result in yield declines in all areas. This analysis was based on a synthesis of 69 studies, which was a vast improvement on the handful of studies used in the TAR (IPCC, 2001). But even since the IPCC FAR (2007) there has been a much larger number of studies which examine the impacts of climate change on crop production and yields, including global multi-crop studies, down to regional and national studies on individual crops. This chapter summarizes the IPCC findings, and provides a more detailed analysis of impact studies arising from 2006 to 2009. There are fairly consistent pictures drawn by different studies that show the potential effects of changing climates (Rosenzweig et al., 1995; Parry et al., 1999; Fischer et al., 2002; Hitz and Smith, 2004; Lobell et al., 2008). These all show steeply increasing trends in adverse impacts, particularly in food insecure regions among the tropics, which are likely to increase the extent to which these regions are food insecure, especially taking into account that most of these regions present the least adaptive capacity. Grain yields are expected to fall in developing countries; however, the opposite is likely to happen in developed countries (Crosson, 1997; Fischer et al., 2001; IPCC, 2007). Geographies of changes may influence yield responses: in high latitudes (where most of the developed countries are located), increased temperatures could increase the duration of growing seasons, thus benefiting farmers. However, in developing countries, which are mostly located in the tropics, this effect would not be observed. Investment capacity within the different agricultural sectors needs to be considered if yield losses are to be offset (Crosson, 1997). Moreover, yield reductions will certainly result in increases in prices of agricultural goods (Rosenzweig and Parry, 1994), and this impact will be greater for food insecure regions. Making sense of the results is a challenge thanks to different GCM models being used under different emissions scenarios with different time frames (2030 through to 2100), and most importantly, through different crop modelling approaches. We divide this section up into three broad modelling approaches to report on the likely impacts of climate change on agricultural production: empirical-based studies, mechanistic crop modelling approaches, and niche-based approaches. Further discussion on the impacts of climate change on agricultural production is also addressed briefly by Lobell and Burke (Chapter 3, this volume). Roberts also conclude that current maize varieties in the USA will present low resistance to changing conditions (i.e. low adaptation potential), and that technological options must be developed in order to sustain production. Maize yields in the USA will be likely to decrease by 29% to 2030 and by 46% to 2080 if the B1 scenario storyline is to be followed, with changes in temperature being more important than changes in precipitation, and with northern areas benefiting from temperature increases. Soybean and cotton production will also be affected, with decreases in yields ranging from 16-21% by the 2030s and 33-72% by the 2080s for soybean, and between 18-19% by the 2030s and 25-78% by the 2080s for cotton. These approaches make use of mechanistic crop models such as the computer models Decision Support System for Agrotechnology Transfer (dssat), Erosion Productivity Impact Calculator (epic) or the General Large Area Model (glam), among others, to examine the changes in crop productivity under scenarios of global change. These models are available for crops for which there is explicit physiological knowledge. Among the benefits of these approaches is the fact that genetic parameters for specific varieties can be incorporated into the scenario analysis, in addition to management practices. This provides a much greater level of detail in assessing impacts, and the evaluation of specific scenarios for adapting to climate change. However, the high degree of parameterization of mechanistic crop models make their application at the global level quite complex (Hansen and Jones, 2000), and requires a number of general assumptions about on-farm management and varietal selection. A detailed review of methodological issues surrounding the use of mechanistic simulation models for predicting crop response to climate change is provided by Challinor et al. (2009). Brown and Rosenberg (1999) use the epic model to show that wheat and maize yields in the USA are unlikely to reduce their potential production by more than 10% if temperatures rise by only 1°C (likely to occur during the 2020s). When temperature increases go beyond 2.5°C (likely during the 2050s), they predict sharp losses in productivity in both crops, and when temperatures increase up to 5°C (i.e. the end of the 21st century), yield losses start becoming severe, with decreases from 13 to 75%. For maize in Africa and Latin America, Jones and Thornton (2003) predicted 10% reductions in yield to 2055, but considerable spatial variability with a mosaic pattern of regions with increases and decreases across both continents. Similarly, Erda etal. (2005) predict up to 37% reduction in yields for rice, wheat and maize in China. Aggarwal (2008) showed that India could lose 4-5 million t of wheat (5-7% of total wheat production) with every temperature rise of 1°C, even after considering carbon fertilization but no adaptation benefits. Challinor et al. (2007) use the glam model for annual crops to predict that groundnut yields in India could drop up to 70%, but show that this depends on the genotypic responses and management practices in the face of adaptation as well as on the water availability (i.e. changes in rainfall). Extreme temperatures are an important determinant of yield in annual crops, specifically in parts of northern and southern India. 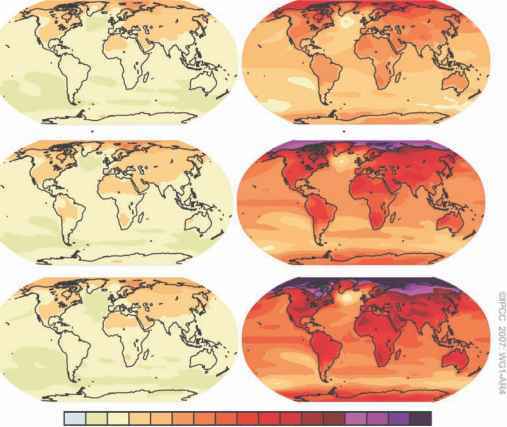 Changes in mean temperature and their impact on development rates, however, could be more relevant than heat stress produced by extreme temperature events in some periods of the year, but this depends on the response of the different genotypes. Genotypic adaptation is thus important to respond adequately to climate change in vulnerable environments, as most of the responses in terms of yield losses depend both on geography and on genotypic responses. Challinor et al. also report that even when optimal temperatures are exceeded, the resulting increase in duration of the growing period could mitigate or even counteract the negative impacts of passing reproductive temperature thresholds on yield; however, there should also be enough water to supply the crop's extended growing season. Sensitivity of genotypes might be a key determinant when extreme events become more frequent and more intense, and this also influences the inter-annual variability of the crop's yield (Challinor and Wheeler, 2008). Impacts of climate change on yields are driven by the response of the crop to mean temperature and mean temperature alterations, the physiological response of the crop to increased CO2 concentrations, the interaction between water stress and CO2, and the interactions between the different variables and their respective changes and change rates with the crop (Challinor et al., 2009). However, considerable attention has been paid to the evaluation of yield responses under changing climates, even if current mechanistic models are not widely accepted and have not yet been proven to accurately model current responses of crops to environmental conditions. Niche-based approaches (also referred to as agroecological zoning approaches) generally take a simpler view of crop adaptation, and are especially useful for examining the impacts of climate change on crops when there is reduced physiological knowledge, such as is the case for many minor crops. Niche-based models use broad climatic parameters of crop adaptation, and locate those 'niches' under current conditions and into the future through coupling with GCM predictions. Two studies have taken this approach to examine the global-scale impacts of climate change on a range of crops. Fischer et al. (2001, 2002, 2005) use a global agro-ecological assessment and depict more than three-quarters of the global land surface as unsuitable for rainfed crop cultivation, suffering severe constraints or being too cold (13%), too dry (27%), too steep (12%), or having poor soils (40%). They show that under climate change, mixed and geographically varying impacts will be observed on crop production. Developed countries substantially gain production potential, while many developing countries lose. At the global level, however, enough food could be produced on currently cultivated land if sustainable management and adequate inputs are applied (Fischer et al., 2002). However, attaining this situation will require substantial improvement of socio-economic conditions in many developing countries to enable access to inputs and technology (Fischer et al., 2002). Lane and Jarvis (2007) used the Ecocrop model on 41 important crops, and using the HADCM3 GCM and the A2A SRES emissions scenario showed how the geography of agriculture is likely to change. The predictions indicated moderate increases in overall agricultural suitability to 2050, but there were significant regional impacts for some crops. The study indicated that varietal and/or crop substitution could be a key strategy to adapt agriculture. For a given site, there is high likelihood that crops which are currently adapted to the conditions will become maladapted, so that new within-crop diversity will be needed to adapt to future conditions, and under extreme conditions different and well-adapted crops will be required. The list of studies on climate change impacts is lengthy, and this section has only presented a snapshot of studies for the three different approaches. The overriding message from all the studies is that considerable uncertainty still exists in quantifying likely impacts of climate change on crop productivity, as a range of different methodological approaches are used, with often conflicting results. Further research is needed in synthesizing results, as well as addressing model differences and taking more holistic approaches to evaluating impacts.